At Leicester Square, most people pass by without paying any attention. Just a small number of people throw their glances at him for a few seconds and then go their ways right away. People possessed by ghosts would ask some questions for picking quarrels with him. And people with diseases would ask Tathagata if he could cure them. Every Sunday Tathagata gives a speech in a loud voice at speaker’s corner in Hyde Park but most responses he usually experiences are nothing but heckling, playing jokes, insults, etc. There are also a group of people who insult Tathagata, calling Tathagata a devil. Tathagata says, "I am the enlightened being and I am like a mirror. You cannot see yourself before you stand in front of me. Now you see yourself reflected in the mirror. You call me a devil but actually you are devils." 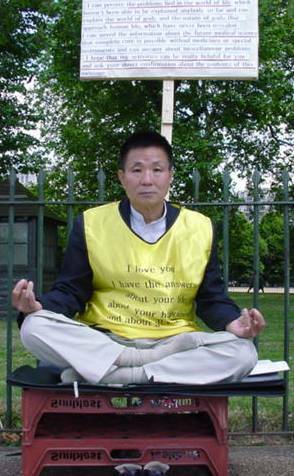 There are many kinds of religious groups at speaker’s corner. Tathagata says to them, "You don't even try to learn the truth and are telling what you are unaware of to people. That is to say, you are telling a lie." 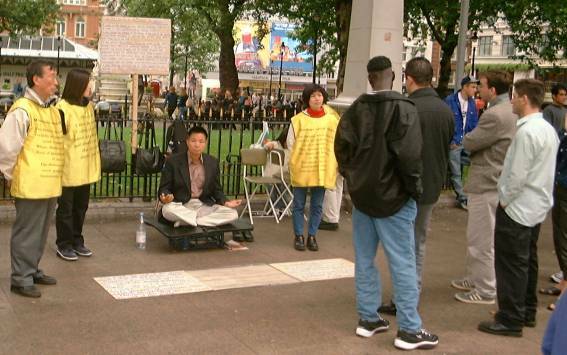 There have been several street performances around Leicester Square while Tathagata was sitting there. The performances were always surrounded by a lot of people enjoying them. There is obvious contrast in the number of people gathering between the two sides. Tathagata says, "People don't appreciate their lives and are just wasting time and money on nothing but fun. How on earth can people have interest in my message, 'Here is your eternal life.'?" Some people say that words of Tathagata are similar to those of religions. So Tathagata responds, "To the blind, day and night are not different." Tathagata talks about the indifference of people to the truth, "It is like talking to a wall." When people asked how Tathagata could cure incurable diseases, he said, "It is the power of the truth." Tathagata says to people, "Please try to listen to the truth and don’t try to listen to falsehood! Falsehood will ruin your life and the truth will bring you blessing." "If you want to verify my enlightenment, please refer to the four greatest teachers in history. They were Buddha, Jesus, Socrates and Laotzu. They could recognize what exists in the world with their enlightenment and tried to teach people only truth. However, people turned their faces away from them. What is much worse, they were killed in a cruel way or they wandered endlessly to search for a person who wanted to listen to them and then passed away. I have been doing this work for 16 years. But it has not been easy to meet people who are unwilling to serve me even a glass of water." If you want to meet Tathagata in London, you can do so at speaker’s corner on Sunday. If you can be with Tathagata just for several days, you will understand his endless love toward the world.